When building social collaboration in your workplace, tagging or mentioning other users in your posts is an important technique for making sure your messages will reach the right audience. In social networking communication, this can be accomplished with an @mention or a similar method of referencing one or more users or user groups. Individuals mentioned in this way will get a notification — in the social stream and possibly also by e-mail — that they have been mentioned in a post. 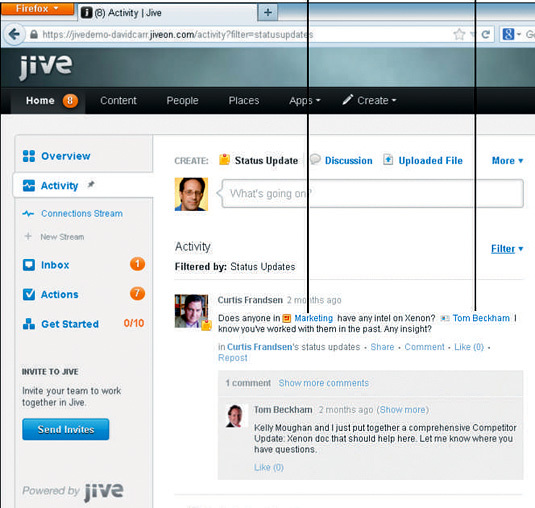 The following figure shows a post in Jive that mentions both a group (Marketing) and a user (Tom Beckham). The text of each mention appears in a different font color (blue) and links, respectively, to the group and user profile. As a result of this tagging, the post shows up in the marketing group feed, as well as the public activity feed. Tom Beckham gets a notification that he has been mentioned and responds. The message has achieved both the broadest distribution and delivery to a more focused audience. When you post to the company-wide activity stream, your potential audience is the entire company, but that does not mean the entire company will see your post. And in many ways, that’s a good thing. You can post something to the company-wide stream that you would never want to send to a company-wide e-mail alias — as in, items with the potential to be of interest in many parts of the company but not necessarily to every individual within the company. And that’s okay because the activity stream doesn’t demand an employee’s attention the same way that an e-mail inbox does. Employees may be reasonably expected to read all internal company e-mail, but a large organization with a busy activity stream can’t reasonably expect the same of the global stream. Instead, employees skim the social feed looking at the most recent items and the ones with the most comments or other activity. If some posts stream past unread, that’s just the nature of the medium. Items you post to the stream will therefore be subject to all sorts of possibilities for serendipitous discovery. But what if you want to make sure someone sees your post, because your post is a public thank you to that person and you want to make sure they see it. Or, you think they’re likely to have the answer to the question you are posing. You’re posing it to the general feed in case someone else has the answer, but you also have a short list of people you suspect can answer it. By tagging those people with an @mention, you can ensure they will be notified that you particularly want to hear their thoughts.